The PGM and Dep PGM along with representatives from the Mark Benevolent Fund joined Colchester NHS Trust staff; families, Essex Mark Masons and Hope for Tomorrow trustees to launch our mobile chemotherapy unit 'Maureen' at Colchester NHS today. The Colchester NHS mobile chemotherapy is the 11th unit to be commissioned by the charity and the fifth to be totally funded by Mark Master Masons. This new vehicle and was named after Maureen, a local nurse who died from cancer, but in her life time was a supporter of Hope For Tomorrow. The picture shows Maureen's sister and two brothers cut the tape to declare it open for business. The unit was then taken to Colchester Masonic Centre where it was parked nearby and over 30 attended to give her a good look over and enjoyed drinks and nibbles at the St. Giles Masonic Centre. The mobile unit will be put straight to work next week, providing Chemotherapy care and support in the community, on Tuesday at Halsted Town Hall car park; Wednesday at the Tiptree Tesco car park; Thursday at Colchester and Fridays in Clacton. The PGM reiterates that this is a momentous occasion to represent the Mark Master Masons of Essex and that the commissioning event was so nice to see something this worth while and tangible resulting directly from the donations made by Essex. The unit will support and enhance the lives of many cancer sufferers in the Province, and is something that we can all be proud of. Maureen's sister and two brothers officially opening our, Essex, unit named in her honour. 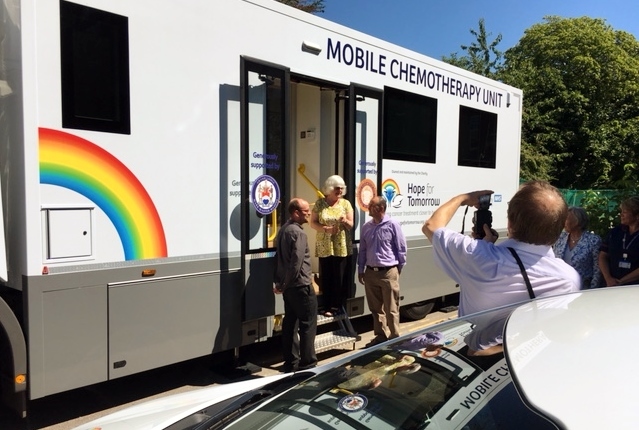 As an update to the below news item published a short while ago, the Provincial Grand Master is delighted to announce that Hope for Tomorrow will be handing over the 11th mobile chemotherapy unit to Colchester NHS next Tuesday 19th July at Colchester Hospital. Unfortunately, due to space restrictions and time constraints, attendance at the Hospital is by invitation only, BUT, we have been lucky enough to arrange for the unit to visit Colchester Masonic Hall in the afternoon after the ceremony at the Hospital. The vehicle will be available for you to see in Flagstaff Road, Colchester, which is about a 2 minute walk behind the Masonic Centre. The vehicle should be there from about 1.30 pm to 3 pm. We appreciate that it is not much notice, but this has been arranged on the quick as we had difficulty finding a suitable place for the vehicle to park. All are welcome so please try and visit if you can, its a great opportunity to see where your money has gone and to show your support for such a wonderful charity. One of the existing mobile units. As we move into a new year, our Provincial Grand Master, R.W. Bro. Terence D. Sheern is delighted to announce that one of the Hope for Tommorrow Mobile Chemotherapy Units, along with support vehicles, is to come to Essex. The Colchester NHS Trust has agreed to accept and manage the project which has been donated as a direct result of the generosity of Mark Master Masons of Essex. As part of the celebrations leading up to the 150th Anniversary, the Mark Benevolent Fund has been supporting the Hope for Tomorrow units with the Grand Master taking the lead with a donation of £260,000 in August 2014; the total pledged by the Mark Benevolent Fund is an amazing 2.6 million! The Mark Province of Essex, its Lodges and Brethren have taken the appeal to their heart and, with their continued generosity, the new unit will be made available in Spring of this year. The Colchester NHS Trust, with whom Essex Mark has already got strong ties with the specialist prostate unit, will take delivery and will operate the unit with the continued support of the Hope for Tomorrow Charity. ​ Founded in 2003 Hope for Tomorrow aims to alleviate some of the stresses and strains associated with receiving treatment for Cancer via the provision of Mobile Chemotherapy Units to NHS Trusts. 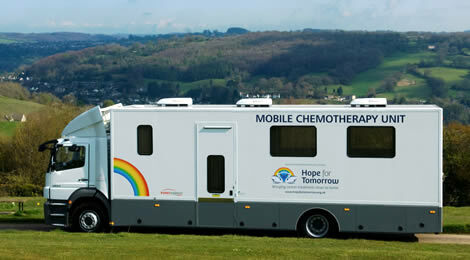 In 2007 the Charity launched the world’s first Mobile Chemotherapy Unit in a unique partnership with the NHS. Owned and maintained by the Charity, and operated by highly trained NHS staff, these well-equipped Units allow cancer patients to receive treatment in a restful environment closer to home, saving stressful long distance travel and minimising waiting times. If any Lodge wishes to add its support to the appeal, please contact the Provincial Grand Charity Steward or the Mark Executive through the email contact button on this site. In the meantime, please take some time to visit the Hope for Tomorrow website and read about the fantastic efforts being made in helping to make chemotherapy easier for patients. The button below is a link to their site. There is, as well, a link to the Mark Benevolent Fund with details of the great works undergone by them.